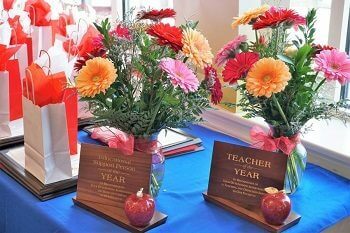 Calvert County Public Schools proudly announces Dr. Nathan Kimbro as the 2019 Teacher of the Year and Regina Hagelin as the Educational Support Person of the Year. Dr. Kimbro is the behavior development teacher at Huntingtown High School. Ms. Hagelin is a special education instructional assistant at Mill Creek Middle School. Through Dr. Kimbro’s enthusiasm for his work and dedication to his students, he has built strong, positive relationships with staff and students at Huntingtown High. Rick Weber, principal, said Dr. Kimbro does a “a masterful job of working with troubled students, teaching them coping skills to help them manage their impulsive behaviors.” He makes an equal impact outside of the classroom by sponsoring the Brothers Reaching Out Club for African American male students. A frequent leader of school and county professional learning, he inspires his colleagues with his commitment, knowledge, and engaging speaking style. Both the Teacher of the Year and the Educational Support Person of the Year received a two-year lease on a new vehicle, generously donated by Bayside Auto Group. Dr. Kimbro will move on to the Maryland Teacher of the Year competition, with the winner being announced in the fall.